22/12/59: Awaiting collection handed over to Controller (Aircraft) at Park Street. 18/1/60: Landed at Thurleigh with hydraulic fault. 9/2/62: Returned to Handley Page. 9/6/64: Arrived at A&AEE. Low level trials. 31/7/64: Returned to Radlett for inspection and APU fit. 19/8/64: Returned to A&AEE. Continuation of low level trials. 27/11/64: To Handley Page. Preparation for engineering flight trials. 1/11/68: Storage pending K2 conversion. 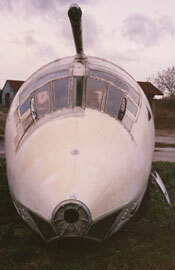 1/5/70: Arrived at Hawker Siddeley Woodford for conversion. 31/10/75: Struck off charge as source of spares. 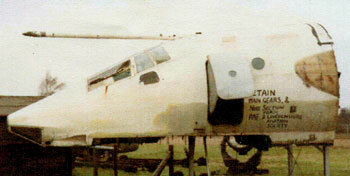 8/83: Aircraft scrapped and Cockpit removed for preservation. Victor B2 XH670 at East Kirkby. Copyright The Cockpit Collection. Victor B2 XH670 at East Kirkby. Victor B2 XH670 at East Kirkby. Door from XL161 fitted to XH670. Copyright The Cockpit Collection. In the above pictures the door from XL161 has been fitted as a replacement on XH670. 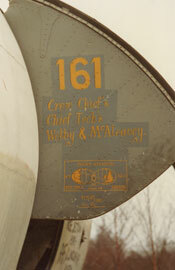 This door commemorates the aircraft's participation in the 1969 Transatlantic air race. 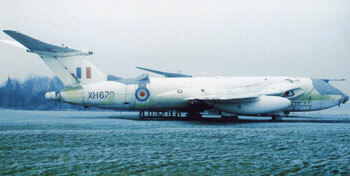 Aim of restoration: This is the last surviving example of a Victor B2 as it was never converted to become a Tanker. The aim therefore is to restore it to as near B2 standard as possible if sufficient parts can be sourced. Anything relating to the Victor B2 that will help us in this restoration, including Instruments, morse key, refuelling nozzle, Handley Page logo boss from centre of control column, squadron patches, Victor Pilot's notes, aircrew equipment and flying clothing, photographs or videos of XH670 in service.